Pattern No. 2 in the Latvia 100 Collection is Laima. Named for the Latvian goddess of fate, this versatile piece can be worn loose (as shown above) or wrapped twice around the neck and shoulders. Work your own version of the Laima cowl with the vibrantly coloured, lightweight merino wool from Fleece Artist, Merino 2/6 (100% superfine merino, 350 m./383 yds. per 125 g skein). Kit No. 1 is in the colours of the original pictured. Pattern is included with kit purchase. Laima Kit No. 2. Price: $86.00 CAD. Laima Kit No. 5. Price: $86.00 CAD. Laima Kit No. 7. Price: $86.00 CAD. Laima Kit No. 8. Price: $86.00 CAD. Laima Kit No. 9. Price: $86.00 CAD. Laima Kit No. 10. Price: $86.00 CAD. Laima Kit No. 11. Price: $86.00 CAD. 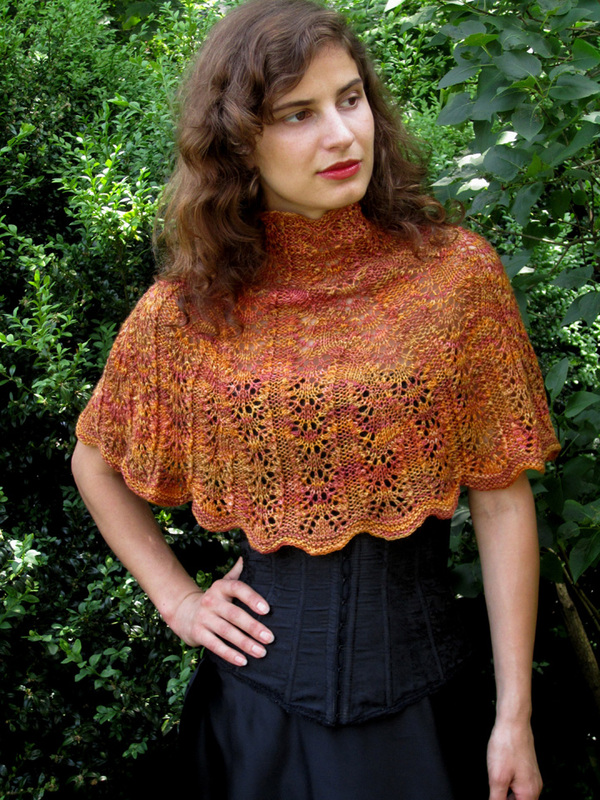 The Tatiana capelet and the Bagatelle shawl each use 2 skeins of Fleece Artist Tree Wool (70% superfine merino, 30% Tencel). The merino makes for a super soft yarn while the Tencel gives it a shine, not unlike silk. And the colours stay bright and pure! Available for $27.00 CAD per skein, you can choose to purchase enough yarn for one of these springtime projects--or for any other project of your own! Pattern of your choice is included with yarn purchase. 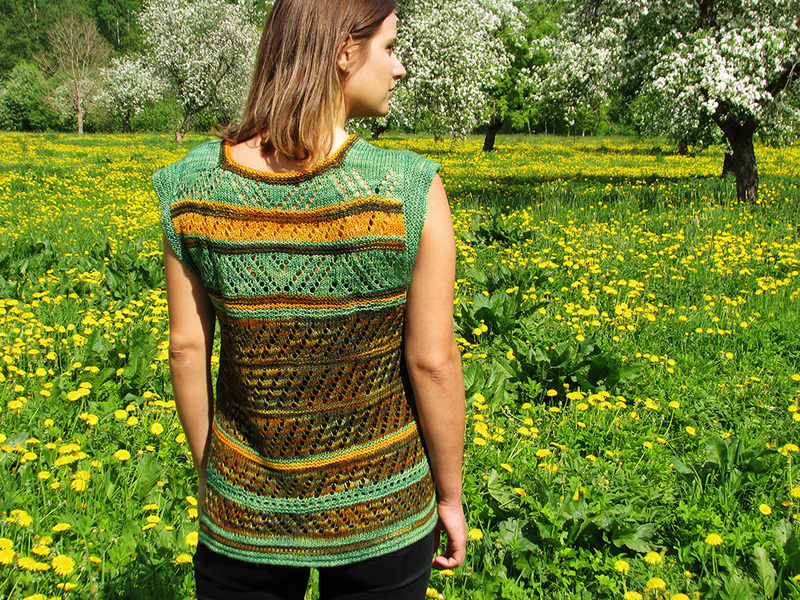 The Daina shell is the first pattern in the Latvia 100 Collection. 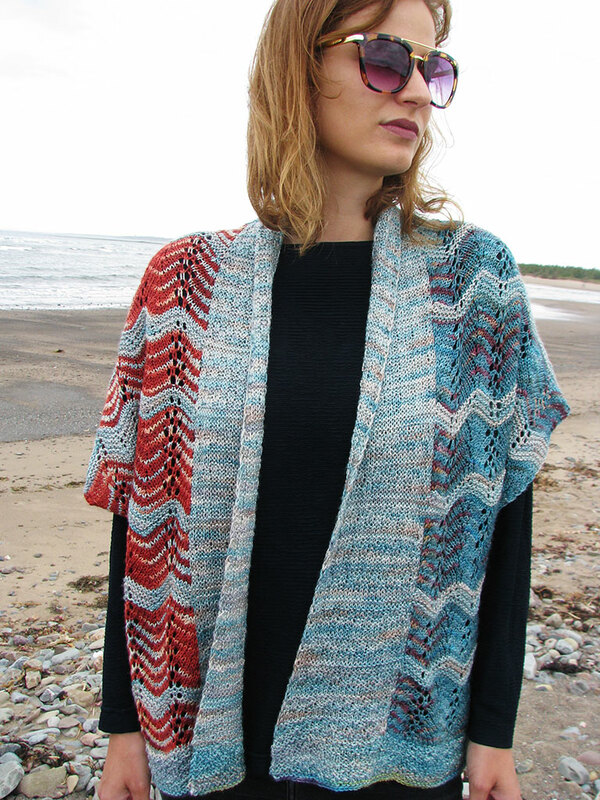 Inspired by the unique folk songs of Latvia, this piece is worked with three colourways of Casbah by Hand Maiden Fine Yarns (80% merino, 10% nylon, 10% cashmere, 325 m./355 yds. per 115 g. skein). This delicious yarn with its 10% cashmere content is soft and warm and makes for a cosy, brightly coloured knit. Pattern is included with purchase. Daina Kit No. 1A, Sizes XS-M. Price: $99.00 CAD. Daina Kit No.1B, Sizes L-2X. Price: $129.00 CAD. Daina Kit No. 2A, Sizes XS-M. Price: $99.00 CAD. Daina Kit No. 2B, Sizes L-2X. Price: $129.00 CAD. Daina Kit No. 3A, Sizes XS-M. Price: $99.00 CAD. Daina Kit No. 4A, Sizes XS-M. Price: $99.00 CAD. Daina Kit No.4B, Sizes L-2X. Price: $129.00 CAD. Daina Kit No. 5A, Sizes XS-M. Price: $99.00 CAD. Daina Kit No.5B, Sizes L-2X. Price: $129.00 CAD. Daina Kit No. 6A, Sizes XS-M. Price: $99.00 CAD. Daina Kit No.6B, Sizes L-2X. Price: $129.00 CAD. Daina Kit No. 7A, Sizes XS-M. Price: $99.00 CAD. Daina Kit No.7B, Sizes L-2X. Price: $129.00 CAD. Daina Kit No. 8A, Sizes XS-M. Price: $99.00 CAD. Daina Kit No.B, Sizes L-2X. Price: $129.00 CAD. Daina Kit No. 9A, Sizes XS-M. Price: $99.00 CAD. Daina Kit No.9B, Sizes L-2X. Price: $129.00 CAD. Daina Kit No. 10A, Sizes XS-M. Price: $99.00 CAD. Daina Kit No.10B, Sizes L-2X. Price: $129.00 CAD. Daina Kit No. 11A, Sizes XS-M. Price: $99.00 CAD. Daina Kit No.11B, Sizes L-2X. Price: $129.00 CAD. Daina Kit No. 12A, Sizes XS-M. Price: $99.00 CAD. Daina Kit No.12B, Sizes L-2X. Price: $129.00 CAD. Daina Kit No. 13A, Sizes XS-M. Price: $99.00 CAD. Daina Kit No.13B, Sizes L-2X. Price: $129.00 CAD. Daina Kit No. 14A, Sizes XS-M. Price: $99.00 CAD. Daina Kit No.14B, Sizes L-2X. Price: $129.00 CAD. Yarn kits for Pattern No. 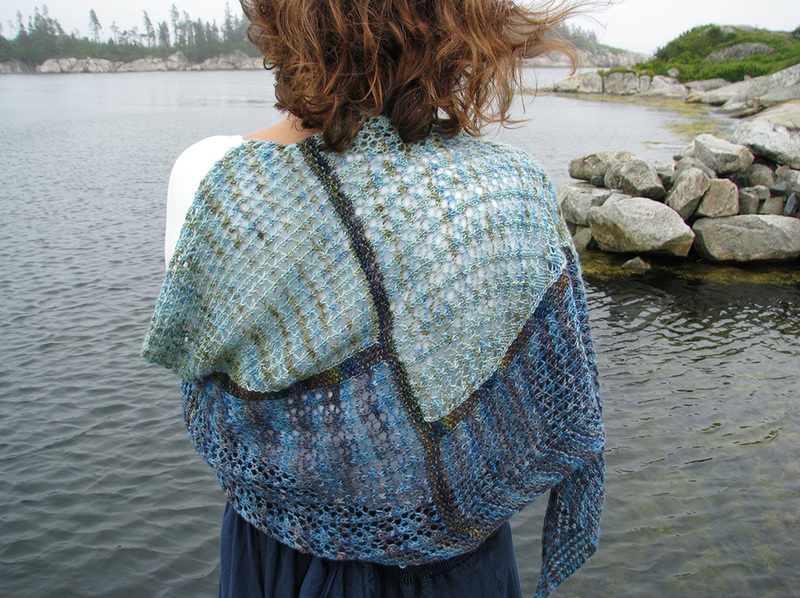 3, the Breaking Waves vest, in the Sea and Shore Club are now available in Fleece Artist Tree Wool, 70% superfine merino, 30% Tencel®, (360 m./383 yds. per 113 g. skein). This lightweight, versatile yarn makes for a comfy garment, perfect to wear any time of the year. Kits contain enough yarn for Sizes Extra Small/Small and Medium/Large. If you require a larger size, please contact me (info@ilgaleja.com) for an adjusted yarn kit. Pattern is included with kit purchase. Pattern No. 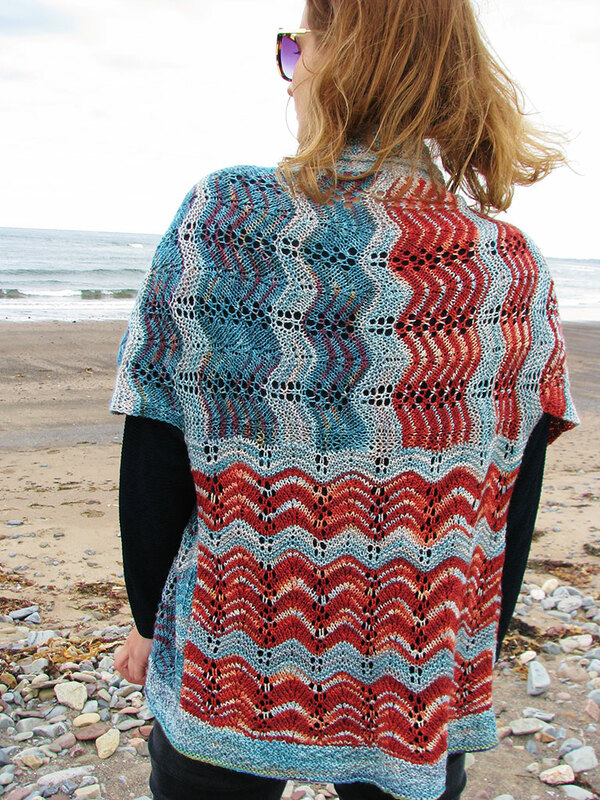 1 in the Sea and Shore Club is the Coveside shawl. Worked from one tip to the other in three colours of Fleece Artist Merino 2/6,100% merino, (350 m./383 yds. per 125 g. skein). 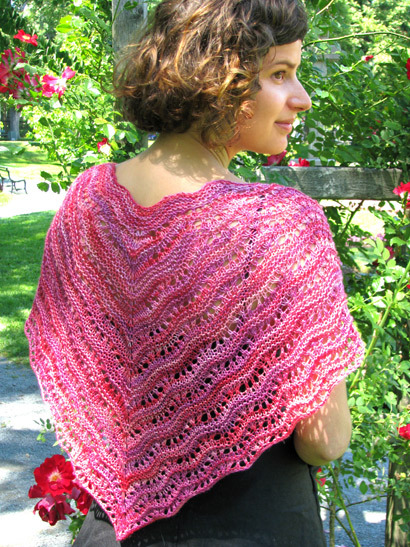 This lightweight and versatile wool yarn makes for a just-right fabric for a shawl that you will want to wear every day, at the coveside or around town. Kit includes just enough yarn required to complete the project. Pattern is included with purchase. The perfect cover-up for spring and summer, it is light and airy while playing with a variety of beach-like colours. Kit No. 1 uses the same colours as in the original sample shown.